The silicates are co-ordinate structures based upon large anions arranged about small cations. 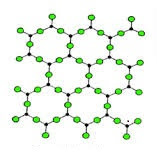 The dimensions of the lattice in general are controlled by the anions rather than cations because of larger sizes. Every silicate minerals contains Oxygen (O-2) and silicon (Si+4). 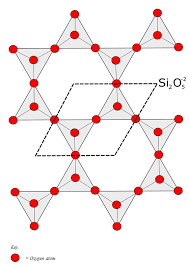 The basic unit in all silicate minerals is the SiO4 (silica-oxygen) tetrahedron. These tetrahedron can occur in the silicate structure either as a single units or join into chains, sheet and three dimensional network by sharing oxygen atoms. Silicates are the important constituents of most of the ceramic materials since they are abundant, cheap and have certain distinct properties. Unique properties of silicates include the ability to conduct electricity, produce a high frequency vibration and provide thermal insulation, because of these characteristics that silicon is the perfect material to make microchips, which run every computer, cellphone and gaming device. Quartz crystals are another silicate with a unique ability to produce a rhythmic high-frequency vibrations. For this reason, these crystals are used to make oscillators used in watches, radios, and pressure gauges. Portland cement is the most widely known silicate. It has the very advantage of forming a hydraulic bond. It is independent tetrahedral. 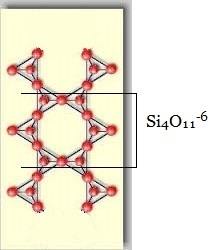 In this structure one silicon atoms fits interstitially among four oxygen atoms. The atomic packing of Neosilicate structure is generally dense which causes the mineral of this group to have relatively high specific gravity and hardness. The crystal habit of these minerals generally equidimensional. If the corner oxygens are not shared with other SiO4-4 tetrahedrons, each tetrahedron will be isolated. Thus, this group is often referred to as the island silicate group. Example: (Mg,Fe)2SiO4 , a mineral having high temperature refractory. 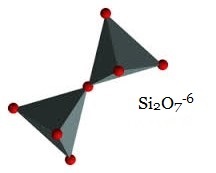 If one of the corner oxygen is shared with another tetrahedron, this gives rise to the Sorosilicate group. It is referred to as the double island group because there are two linked tetrahedrons isolated from all other tetrahedrons. The ratio of Si : O is 2:7. In this case, the basic structural unit is Si2O7-6. A good example of a sorosilicate is the mineral hemimorphite -Zn4Si2O7(OH).H2O. Some sorosilicates are a combination of single and double islands, like in epidote -Ca2(Fe+3,Al)Al2(SiO4)(Si2O7)(OH). If two of the oxygen's are shared and the structure is arranged in a ring, such as that shown here. We get the basic structural unit of the Cyclosilicates or ring silicates. Shown here is a six membered ring forming the structural group Si6O18-12. The ratio of Si : O is 1:3. Three membered rings Si3O9-6, four membered rings Si4O12-8 , and five membered rings Si5O15-10 are also possible. A good example of a cyclosilicate is the mineral Beryl - Be3Al2Si6O18. 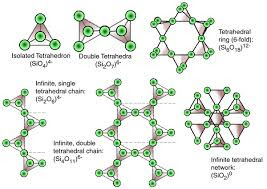 If two of the oxygens are shared in away to make long single chain of linked SiO4 tetrahedra, we get the single chain silicates or inosilicates. 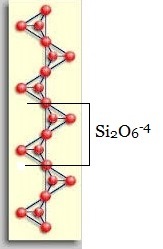 In this case the basic structural unit is Si2O6-4 or SiO3-2. The ratio of Si : O is 1:3. This group is the basic for the pyroxene group of minerals, like the orthopyroxenes (Mg,Fe)SiO3 or the clinopyroxenes Ca(Mg,Fe)Si2O6. If two chains are linked together so that each tetrahedral group shares 3 of its oxygens, we can form double chains, with the basic structural group being Si4O11-6. The ratio of Si : O is 4:11. The amphibole group of minerals are double chain silicates, for example the tremolite - Ferroactinolite series - Ca2(Mg,Fe)5Si8O22(OH)2 , Amphiboles. This type of structure is an extension of silicate tetrahedral unit into three dimensions. If all of the corner oxygens are shared with another SiO4 tetrahedron, then a framework structure develops. The basic structural group then becomes SiO2. The minerals quartz, cristobalote and tridymite all are based on this structure. If some of the Si+4 ions are replaced by Al+3 then this produces a charge imbalance and allows for other ions to be found coordinated in different arrangements within the framework structure. Thus, the feldspar and feldspathoid minerals are also based on the tectosilicate framework. A framework structure is generally hard, has low atomic packing factors and possesses relatively low densities. Glass is vitreous silicate, having a vitreous structure. Glass has a three-dimensional frame work structure containing covalent bonds.